Most Cuban-Americans Oppose Embargo, Poll Finds : The Two-Way The Florida International University poll, conducted since 1991, also showed a large majority want to reestablish diplomatic ties with the island. 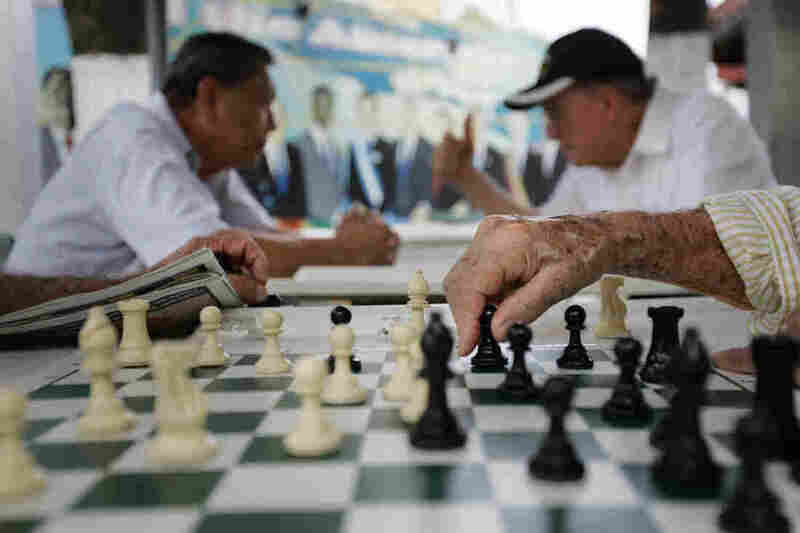 A elderly man makes a move on a chess board at the Maximo Gomez Domino park in Little Havana in Miami, where political opinions are shifting. A new poll released on Tuesday shows a big shift in opinion by the Cuban-American community in South Florida: A majority (52 percent) of Cuban-Americans said the U.S. should end its embargo of Cuba. "We are witnessing a clear demographic shift with younger and more recently arrived Cubans favoring a change in policy toward the island," said Professor Guillermo J. Grenier, one of the co-principal investigators of the Florida International University Cuba Poll, in a statement. Just how significant is the swing? Back in 2011, 44 percent opposed the U.S. embargo of Cuba. In 1991, 87 percent of Cuban-Americans supported the embargo. In an email, Grenier said following Obama's election in 2008, 55 percent disapproved of the embargo. "That was a sort of Obama effect that did not carry over to our Sept 2011 poll where we measured a 56 percent approval of the embargo," Grenier said. Interestingly, when you include only registered voters, this time around, 51 percent of them support continuing the embargo. Still, the poll also found that 68 percent of respondents favor restoring diplomatic relations with Cuba. U.S. policy toward Cuba has played a significant role in national politics, because Cuban-Americans have remained a strong voting block in an important swing state. An earlier version of this post said this was first time the poll had found a majority of Cuban-Americans supported ending the embargo. That's not case. A 2008 poll found 55 percent of Cuban-Americans disapproved of the embargo.